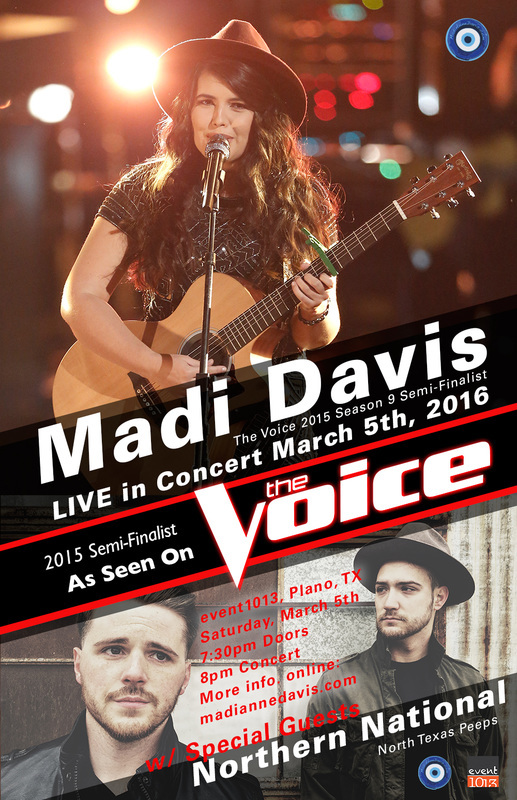 Madi will be performing her first Texas concert since being on NBC The Voice 2015 Season 9. VIP Meet & Greet is your opportunity to meet Madi Davis. Tickets & space are limited get them before they are gone. Northern National is an Alternative band from Dallas, TX. Fronted by Michael Rossi and Michael Kanne their independent debut album "Young & in Love" released on September 2nd, 2014. They are currently working on a new EP set to release in 2016. Since the release, Northern National has been featured on multiple sites including Hype Machine, SoFar Sounds, Reverberation, Music.com, Noisetrade, Brite Revolution, and their song "I'll Be Okay (Crazy World)" has been featured on the TBS TV show "Cougar Town". They released a music video to their single "She" in August of 2014 and since then it has been viewed over 100,000 times. Northern National's live show has been praised as "even better than the record" and "full of energy", with SMU's 'The Daily Campus' stated that "Northern National's performance surpassed most opening acts' performances by a mile." Jordan Buford from 'The Music Enthusiast' said that "as far as pop bands in Dallas go, I don't know if there is one more solid than Northern National." Northern National has already played alongside multiple artists including Andy Grammer, Echosmith, James Otto, JohnnySwim, Jamestown Revival, Green River Ordinance, Max Frost, Steve Moakler, Brave Combo, Paradise Fears, Big K.R.I.T., and William Beckett. You can currently purchase their debut record "Young & in Love" on iTunes by clicking here.